Van Buren is one of Maine’s most northerly towns, hugging the United States border with New Brunswick. 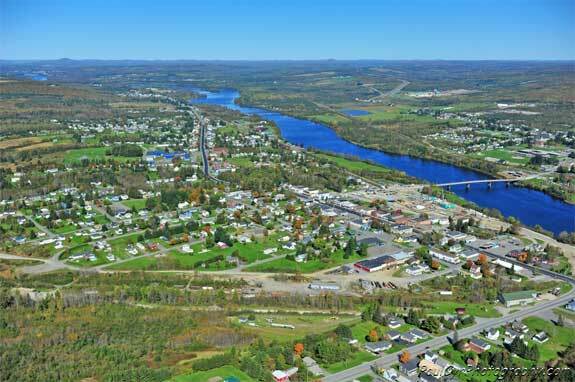 Nicknamed “The Gateway to the St. John Valley,” the town is proud of its heritage as a riverside community. The area was originally settled by the French, and those historical ties continue today, with approximately 75% of Van Buren residents habitually speaking French. Come to this beautiful town on the St. John River to learn about Francophone North America and explore its natural beauty. The Acadian Village gives a fascinating glimpse of the culture of Acadians, descendants of 17th-century French settlers who came to Nova Scotia. The Acadians were active in three major industries — fishing, lumbering, and shipbuilding. The Acadian Village consists of 17 buildings on the St. John River. Several are examples of the distinctive Maine Acadian architectural style. Visit the Notre Dame de L’Assumption Chapel, a blacksmith shop, an old schoolhouse, a country store, a large Acadian barn, Morneault house, a barber shop, and other historic buildings. The oldest of these buildings is from the 1790s, making them significant cultural and historical artifacts. Van Buren and the surrounding communities of Cyr Plantation and Hamlin are great for outdoor enthusiasts. The Bangor and Aroostook Trail is a 58-mile path made of crushed stone and dirt. This makes it suitable for hikers, mountain bikers, horseback riders, cross-country skiers, and ATV users. The Split Cedar Trail is also popular with visitors, who enjoy its 11 miles of peaceful woodlands. The trail is open to snowshoers, cross-country skiers, hikers, ATV users, and mountain bikers. The Caribou Snowmobile Club grooms 170 miles of trails in the area, connecting Van Buren to other surrounding towns. The abundant snowfall and breathtaking scenery of the Van Buren area make it a popular destination for snowmobilers. Water lovers will enjoy spending time on Long Lake, a beautiful clear lake on the outskirts of Van Buren. Although two other towns share the lakefront, no roads connect those towns to Van Buren. This makes the Van Buren portion of Long Lake a more secluded, relaxing getaway. Travel down dirt roads to reach the Van Buren Cove for hiking, walking, swimming, fishing, boating, and kayaking opportunities. If you are interested in exploring the St. John River on the border of the United States and Canada, head to the International Boat Landing and Park. This park hosts numerous picnics, festivals, and other community gatherings for Van Buren residents. The St. John River is popular among canoeists and boaters who enjoy the views of Van Buren and other riverside towns from its rushing waters. For an intimate look at Van Buren’s French heritage, walk down its historic Main Street. Note the Acadian and French architectural details on building facades, reflecting the community’s Francophone culture. Several cafes and outdoor restaurants set up outdoor seating during the summer month, making Main Street a popular gathering place for residents. Explore the cobblestone crosswalks and side streets by foot or on a bicycle to gain an appreciation of the close-knit community atmosphere. Several boutique stores sell clothing, local arts and crafts, antiques, and other collectible items. Van Buren is connected to the New Brunswick city of St. Leonard by a bridge spanning the St. John River. Each year, the communities celebrate the International Grande Riviere Festival in the summer months. This festival features live music, food, picnics, flea markets, and a festive parade. Another popular summer event is the Van Buren Summerfest, with excellent refreshments, street fairs, a chili cook-off, tractor pull, karaoke, recreational activities, movies, live music, a kite flying contest, a hula hoop contest, and other fun events. Visit the following directories to find lodging, dining, attractions, shops, services and recreational activities in the Van Buren, Maine area.